We had this for dinner last night 4 Sept2004. 2. Add beaten eggs to the batter to mix. 3. Heat up a wok, add 2 tbsp oil to heat. 4. pour egg batter to it. 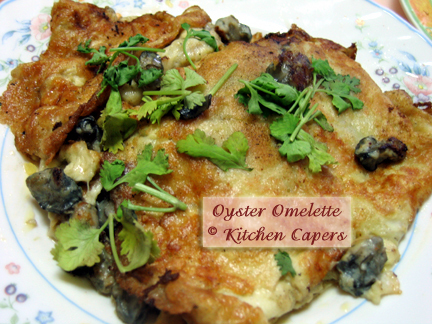 5. when sides of eggs start to turn brown, add oysters on top. 6. Flip omelette over to cover oysters. 7. Fry till omelette is golden brown. 8. To serve, sprinkle chopped coriander leaves on top. I'm a novice cook and have tried this recipe. It's quite good but I somehow failed to get the crispiness that i desire. Could it be that tapioca flour is used instead of the usual sweet potato flour? Maybe also because of the oil or poor heat control?? Again, thanks for starting this forum. I didn't know that you can use sweet potato flour to make the batter. The fire must be hot to get that burnt effect on the omelette. I have always used Tapioca flour. went to Phoon Huat to try to find tapoica flour, but didn't see any. I only saw a packaging that says tapoica starch. Is it the same as tapoica flour? ai ya..same lah. Most provision shops sells it. Even NTUC, Cold Storage, Shop n Save. Costs between 90 cents to $1.20 for a 600g pack. Prices ranged according to which supermarket you go and get. I use this flour a lot for many many kuehs I make. Tapicoca flour n starch is the same??? well, I used to think its different too. Then I tried buying the 2 different ones and use it to make kueh with it. Came out the same leh. A search on the Internet suggests that its the same too. As to why there are so many types out there, I don't know either. turn out ermm..... cantonese called it "yua pek pek" and the hokkien called it as "nuah nuah" and what it called it in english soggy soggy?? eh it my own fault again, trying to act smart think i could fry like those guys in hakwer centre. now i know why must "2. Add beaten eggs to the batter to mix." the chilli sauce is made with blended chilli, white vinegar and sugar. but you need to add lots of white vinegar. like half a bottle of it to make it watery and very sour. Sugar is added to lessen the sourness. Thanks Gina. will go try it.